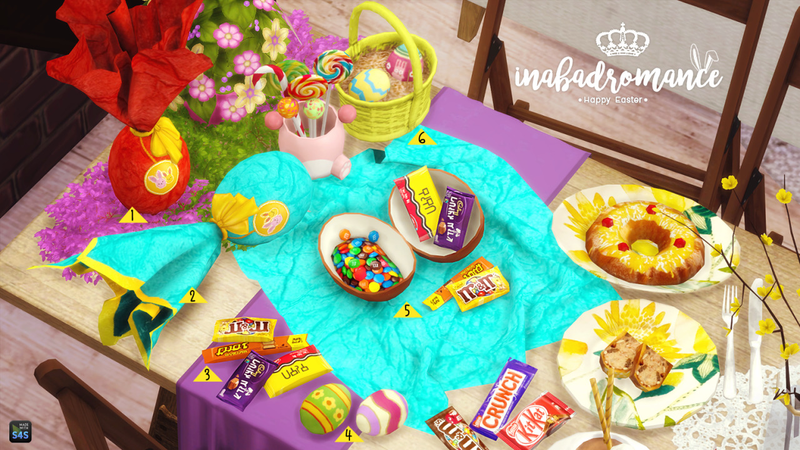 In a bad romance by Laura Peralta: Happy Easter 2015: deco & poses. i’ve been on and off with this set for about two weeks now while doing other things at the same time, i might as well share it now so that if anyone would like to use it can have time to prepare when easter comes :) hope you like it! Mesh / EA’s mesh edits by me. Easily find by typing “easter” on the search bar. Wrapped Chocolate Egg (standing): 1300. 4 colors. Wrapped Chocolate Egg (laying): 1300. 4 colors. Deco Chocolates: 192. Regular & HQ (no mipmaps). Simlish & English. Open Chocolate (with paper, makes it high-ish poly): 1700: Same colors as 1°. Regular & HQ (no mipmaps). Simlish. Open Chocolate (without paper, if you want less poly): 800. Regular & HQ (no mipmaps). Deco Children Basket (thanks to @jorgha-haq​ for letting me use his ts3 exported version! ): 840. 12 variations. Left Wrist, in bracelets. Only everyday outfit. Uses ring space, should not override any other accessory up to date (the ones that came with the game). 7 poses in total + All in 1. To be used with deco toy + acc basket. To use the couple pose, place 3 chairs in line following the game grid. Go into live mode and sit the first adult in chair 1, child in the middle, and second adult in the last chair. wait for them to sit, and cancel all actions. Delete the chairs in buy mode. Go back to live mode and make the sims pose accordingly. >> Download: Dropbox (Adfly - Wait 5 seconds and click skip, don’t touch anything else!, thanks!) ** update 03/22/16: added separate package for pose pack. - Merged collection available (All objects + Pose Pack). - 1st preview: deco shrub (recolor for shoot), tablecloth, flowers, candies+vase (same as previous), +chocolates, Rosca de pascua (=food in plates, mine). - 2nd preview: top / dungarees / shoes (get together).